GTA 5 allows players to pilot a variety of vehicles, including cars, motorcycles and boats. Airborne vehicles are also available, but players will find it difficult to find them on the map. Needing to find a force helicopters and planes? Check out the tutorial. One of the most obvious places to get an aircraft, it is also one of the most complicated and dangerous. To quickly enter the airport, use the ramp shown in the video. The security organization of Los Santos has what is best in armaments. Among them is the powerful Buzzard, equipped with missile launchers. Go to the area marked on the map and look for it on top of the buildings. 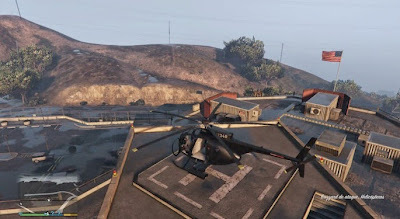 Having Trevor as its owner, the hangar Sandy Shores is a place of free access to the character, where a helicopter that can be used at any time is saved. Just drive to the place to find it. In the same place, you can still fly aerobatic aircraft in skill challenges posed by the game. Therefore, it is only approach the plane and start the challenge, which has different difficulty levels. This is a good way to better your skills in flying aircraft. Located in the middle of Los Santos, the hospital has a helipad on top, which are occasionally resting rescue helicopters or even the police. They can be obtained in both online mode and offline. But a little perseverance it takes to find them available.